Manchester United and Tottenham target Ross Barkley looks set to leave Everton after rejecting a new contract offer, according to The Daily Mirror. The 23-year-old worked his way up through the youth ranks at his boyhood club before making his senior debut back in 2011, and has since then gone on to play a further 178 times for the Toffees, netting 27 goals along the way. 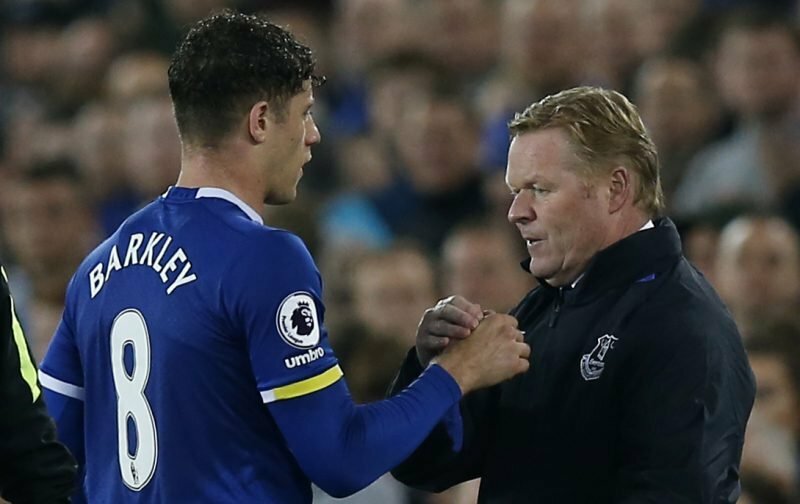 However, last season was a testing one for the England international under new boss Ronald Koeman, who occasionally criticised the midfielder and indeed dropped him from the starting eleven, although Barkley did go on to score five goals and lay on eight assists in 36 Premier League appearances. Nonetheless, Koeman made it clear that if he didn’t sign a new deal this summer then he would be sold, and with no contract extension signed by the 23-year-old, it appears that his long association with the Merseyside outfit will be coming to an end. And with Ajax playmaker Davy Klaassen strongly linked with a move to Goodison Park, as is Swansea sensation Gylfi Sigurdsson, staying put is surely not an option for Barkley as he looks to reignite a career at both club and international level. Premier League giants Manchester United and Tottenham have both been linked with a move for Barkley, which demonstrates how highly the England star is thought of, yet where his future lies very much remains to be seen. However, it seems apparent that it isn’t at Everton under Koeman.